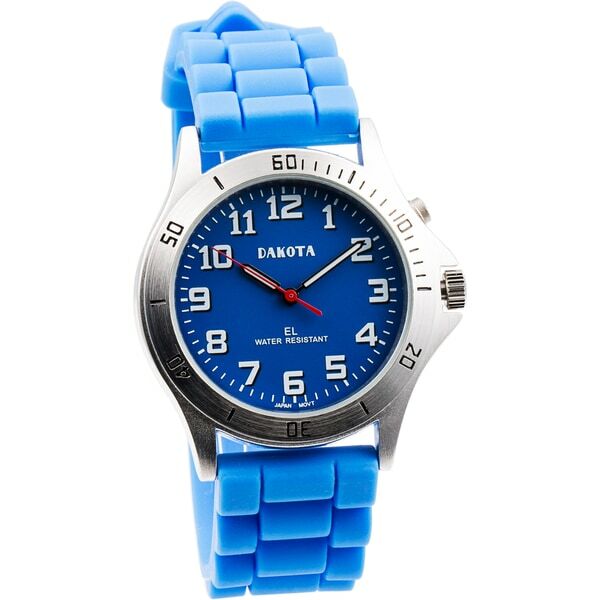 Strap some colorful fun to your wrist with this Dakota Sport E.L. unisex watch. This watch features a matching dial and strap offering a vibrant burst of color in a casual, sporty design. Large white number markers and silvertone luminescent hands make it easy to check the time at a glance, and an electro luminescent dial light offers illumination for reading the time in the dark. Featuring a brushed alloy case and bezel for durability, this watch has a water resistance of 99 feet for protection against wet conditions. A pin buckle clasp keeps the watch secured to your wrist, and a silicone strap offers comfortable wear. Perfect for my small wrist. Love the unisex size & colors offered. I bought orange. The light is a nice feature. I have a size 8.5 wrist and it is a great fit. Watch face is easy to read, and I love it. I would recommend this product. good casual watch but I don't care for the silicone strap, I have small wrist. it fits but I prefer link band. I actually received this same watch last October for my birthday. I had wanted a sporty white watch with the silicone strap. I loved it so much, that I purchased it for my sister on her birthday in April. Dakota makes a sturdy product and we will definitely purchase other items from them. Was surprised how comfortable this watch is to wear. Very easy to read. I have gotten more compliments on this watch than anything else I wear. It feels great on, and I do think it is very pretty. For some reason it seems to be a conversation piece and it's fun. The orange pops and makes a bland outfit "hip". I do suggest. This watch held up well in all kind of conditions when I was farming this summer. It got wet, it got filthy, and it's still looking and working well. Well my daughter just received this watch and flipped out. She is new on the swimming team and loves the fact that she can take it in the water and also the fashionable color she got (Blue). I'm sure her friends will want to get some also since they come in so many colors. Nice inexpensive watch, waterproof, good for pool or beach day. Bought for wife, she needed a blue watch and this was perfect. Nice watch, bold orange, super price only thing wrong is missing date. This seemed like a really nice watch but it was so big I couldn't wear it on my wrist, maybe my upper arm but I have a small frame and it wouldn't go small enough. I love the light that you can use in the dark. The band on this watch looked and felt like cheap plastic. It was a disappointment so I sent it back even though it was reasonably priced. very nice watch -- recommend. would still like to get this in other colors....specifically red and green! This watch was much bigger than I expected. Made to fit a man, and I have tiny bone structure. Really my fault for not truly assessing the dimensions before purchasing. This is an adorable watch I bought for my niece, who loves pink. (It comes in quite a few colors) I don't know how well she likes it since she has not received it yet. Her birthday party is June 31st. I think she will like it just fine. It's a fun, trendy watch and she is a young soon to be teen. I wanted something colorful, casual and inexpensive to wear to work everyday. I am a nurse and needed a watch that I can read easily. "My wrist is 8.5 inches and I like a loose band. So what is the total watch length including the band and watch case? Will it fit my 8.5 inch wrist PLUS about another 1 inch?" Hello dee02116, It is 9.5 inches long. Thank you for shopping with us.